Hello Kentuckiana Brides! Just would like to remind you of an upcoming bridal trunk show over at the Bridal Warehouse here in Louisville Kentucky. 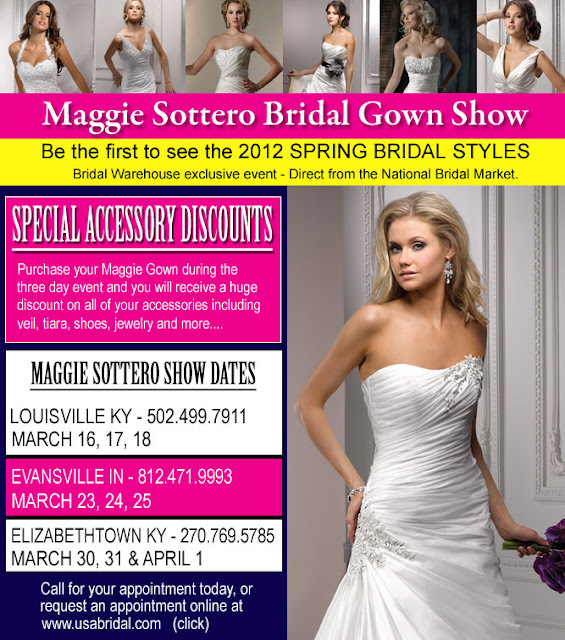 Maggie Sottero is famous for its designer wedding dresses, bridal gowns and bridesmaid dresses. Maggie Sottero has been honored to receive numerous additional bridal industry awards, as well as nominations for a host of others. Now, you have a chance to see the Maggie Sottero 2012 Bridal Wedding Dresses Collection. The trunk show will be from March 16 until 18, 2012. For reservations, you can visit the Bridal Warehouse website.